When you think about sport in Australia, the first things that come to mind are usually AFL, NRL and cricket — but the nation also has a long and proud history with the world game, soccer. As a nation of immigrants, soccer is an important part of Australia’s culture — one of the sports that brings people from all backgrounds together underneath the Australian flag. While AFL, NRL and cricket has dominated headlines, sponsorship, crowds and media attention, soccer has continued its slow climb to the hearts and minds of all Aussies. The Socceroos have evolved from a team of semi-pros and amateurs into a side capable of competing with the world’s best. Which Australians have dominated on the world stage? How has Australia fared when it has qualified for the World Cup? Let’s take a look at our World Cup history. 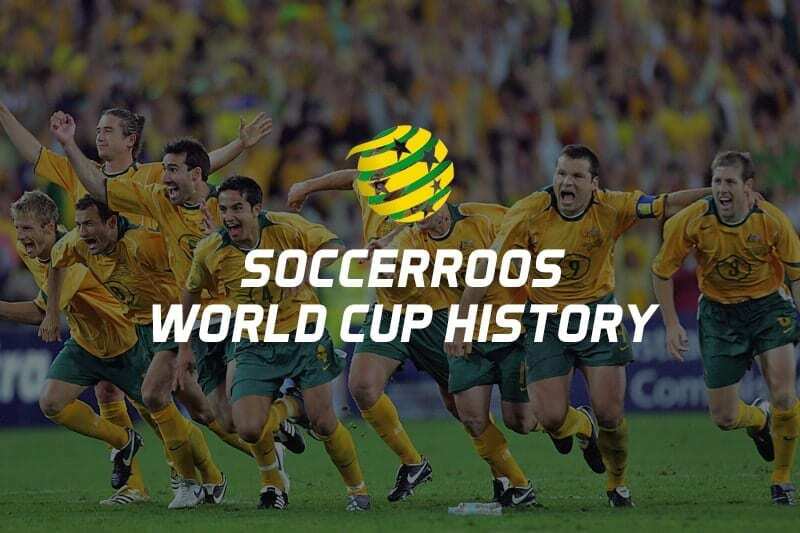 After decades in the soccer wilderness, Australia qualified for its first World Cup in West Germany in 1974. A team mostly filled with amateurs came up against season professionals from footballing powerhouses and the results went as most expected — the Socceroos drew a game with Chile before losing to host nations East and West Germany and got bungled out of the tournament. Despite the disappointing results, Australia had a taste of the big time and the seed had been planted for future success. As fate would have it, Australia’s next World Cup appearance would be at the same venue, some 30 years later. Returning to the game’s biggest stage for the first time in three decades, the Socceroos brought confidence and momentum into its 2006 World Cup campaign on the back of a heart-stopping qualification triumph over arch-nemesis Uruguay. After years of heart-breaking failure at the qualification stage, the Socceroos finally had the quality and skill to not only make it to the World Cup, but some belief that they could do some real damage while they were there. With Dutch master coach Gus Hiddink in control and a playing squad that included some of the very best Australians to have ever played the sport, the Socceroos were back in Germany for a World Cup and had a statement to make. In its first match again Japan, Australia were down 1-0 early in the match, but had an inspired finish to win 3-1 thanks to a brace from star striker Tim Cahill. After a hard-fought 2-0 loss to reigning champion Brazil, Australia was left with a do-or-die clash with Croatia to make it past the group stage. A 2-2 draw with Harry Kewell kicking a late equaliser was enough to see the Socceroos advance, where their next opponent was Italy. The match with the Azzurri was a defensive, tense battle that failed to produce a goal until the final few seconds of regulation when a questionable penalty was granted to the Italians, who scored from the spot to advance and break Australian hearts. Italy would go on to win the World Cup. Four years on from the heroics in Germany, things just didn’t go right for the Aussies in South Africa, where the Socceroos failed to get past the group stage. The Socceroos squad still included talented names like Harry Kewell, Mark Bresciano, Lucas Neil, Tim Cahill and Mark Schwarzer, but some questionable selection and playing tactics from coach Pim Verbeek got the Australians off to a horror 0-4 start against Germany that they failed to recover from, despite a 1-1 draw with Ghana and a 2-1 win over Serbia. With a host of its stars having retired from international duty, the Socceroos still managed to qualify for its third-consecutive World Cup — this time in Brazil — but was not expected to make any waves after drawing a ‘group of death’ that included Sain, the Netherlands and Chile, all teams inside the top 15 in world rankings. The Aussies had a rough start, losing to Chile 3-1, before a brave showing against the highly-rated Netherlands, in which they led 2-1 after two incredible goals from Tim Cahill, before going on to lose 3-2. Spain ended Australia’s campaign in a 3-0 dead rubber result. The veteran was a hero for his nation during the 2006 and 2010 campaigns and had an accomplished club career that saw him play 625 matches well into his 40s. Perhaps Schwarzer’s most iconic moment was the save he completed during a penalty shoot out that helped the Socceroos advance past Uruguay into the World Cup. Lean, lanky and balding, Chipperfield was never the most fashionable player in the Socceroos. He was, however, one of the most reliable, giving a dozen years of solid service that included the 2006 and 2010 World Cups. The 68-time international played either side of the midfield with aplomb, but much of his best work for Australia was done in the left fullback position. The old red head played 52 matches for his nation throughout his international career that also included more than 250 club matches in both the Scottish Premiership and English Premier League. Moore played in both the 2006 and 2010 World Cups and often had the responsibility of controlling the central midfielder role. Lucas Neil will forever be remembered as the man who gave away a last-minute penalty to Italy in the 2006 World Cup knockout stage, but Socceroos fans will also remember his incredible leadership and form during the tournament, where he was eventually named in the tournament’s best eleven players. Neil captained Australia at the 2010 World Cup, was named as the man of the match in the all-important World Cup qualifier in 2006 that helped his nation break its long drought and played more than 500 club games as a professional in the EPL. Brett Emerton was a true gun of Australian soccer, having played 95 games for his country between 1998 and 2012 and another 330 professional games across Europe and the EPL. Emerton was known for his pace, endurance and his flexibility to play as both a winger and defender. Emerton featured in the 2006 and 2010 World Cup squads and was a consistent, reliable performer. Grella, who mostly plied his trade professionally in Italian leagues during his journeyman club career, was an absolute star in the 2006 World Cup for Australia. His efforts in the midfield gaining him a nomination for the FIFA’s team of the tournament. Grella was a hard-working industrious midfielder that was a diligent defender and a quality passer. He played 46 games for his nation. Bresciano was the magician at the heart of the Australian engine room, proving to be a stalwart of the Socceroos in his 84 international appearances that included three World Cup campaigns — 2006, 2010 and 2014. The hair-challenged Aussie was typically responsible for most of the dead-ball kicks forward of centre and had a flair for both kicking and creating goals. Teaming up with Tim Cahill for more than a decade, Bresciano was one of the best players to ever wear the green and gold and always performed on the big stage. Jedinak has been a stalwart of the Socceroos since breaking into the side in 2008. After an impressive showing as a defensive midfielder in the 2010 World Cup, Jedinak was handed the captain’s armband in the 2014 World Cup and will also lead his nation in the 2018 campaign. Jedinak has played 75 games for the Socceroos, kicking 18 goals. His endurance, toughness and leadership have endeared him to football fans around the country and his club career, most notably for Crystal Palace in the EPL, has only added to his reliable reputation. His greatest moment for the Socceroos came in 2016 when he lead Australia to its first ever Asian Cup triumph. It could be argued that Australia has never had a centre forward as prodigiously talented as Mark Viduka. The six-foot striker was blessed with incredible skill by foot and in the air and often played as a battering ram, absorbing defensive pressure and creating opportunities for his teammates. Viduka captained the 2006 World Cup squad — clearly the best side the Socceroos have ever fielded — and led from the front in his one and only World Cup. Viduka played 43 games for Australia and played more than 400 club games in a professional career that saw him become one of Australia’s most successful athletes throughout the 1990’s and early 2000’s. While Viduka was the most talented centre forward the Socceroos had ever seen, Harry Kewell was the most talented all-round footballer the country ever produced. From the moment he debuted for his nation as a teenager, Kewell was always going to be something special. The left-footer played a forward-midfield role that maximised his incredible vision, passing ability and powerful striking. His ability to attack defenders with the ball made him a devastating match-up for any defence and if it wasn’t for a constant injuries late in his career, he could have been even better. Kewell played in the 2006 and 2010 World Cup campaigns, was instrumental in helping the Socceroos qualify in 2006 and had an incredible career in the EPL and across Europe, where he was once selected in the PFA team of the year. There are few people in all of Australian sport that can claim to have done as much for their nation as Tim Cahill has done for the Socceroos. Cahill has earned more than 100 caps for his country and was the very first Australian to have scored in a World Cup — his brace helping Australia win its first World Cup game against Japan. Cahill has scored in all three World Cups he has played in (2006, 2010, 2014) and has scored five World Cup goals – also a record for his country. Cahill, who uses his strength in the air to his advantage is known for his deadly header and quality striking. He has scored 50 goals for his country, another record, and has played more than 600 professional matches in England, China and Australia. Can Cahill add to his tally in the 2018 World Cup? Don’t bet against him. The Socceroos continue their Asian Cup defence with a tricky knockout clash against the hosts. Can the Socceroos bounce back? Check out the best bets for Friday's clash in Dubai. Can the Socceroos kick off their Asian Cup defence with a win over Jordan?